SANTA ROSA, Calif. -- Police arrested a 16-year-old suspect Tuesday afternoon in Santa Rosa after he allegedly caused a disturbance and threatened to shoot someone at a shopping center. According to police, at 4:25 p.m. officers were dispatched to the Montecito Shopping Center in the 6200 block of Montecito Boulevard on a report of a person with a gun. The suspect was allegedly yelling and threatening to shoot a person who he said stole something from him. The suspect also allegedly had a silver handgun in his sweatshirt pocket, police said. When officers arrived they located and attempted to detain the suspect. A struggle broke out and one officer found what appeared to be a real revolver in the suspect's pocket, police said. Upon further inspection, officers determined that the gun was a replica firearm, and it was loaded with bullets. 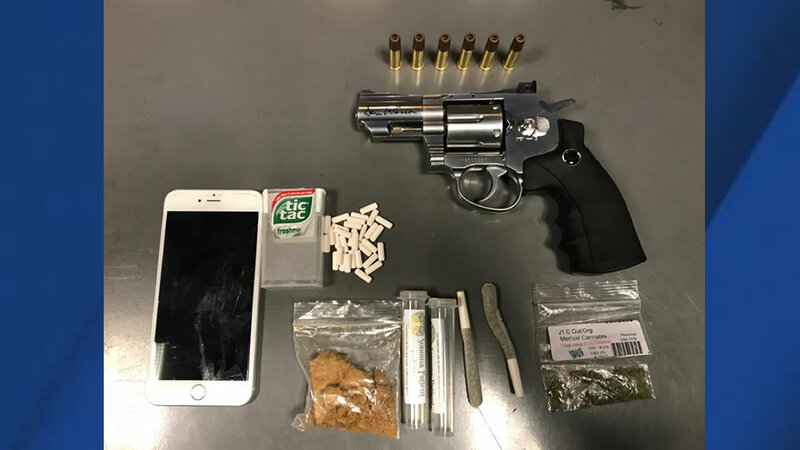 Officers also found Xanax, cannabis and marijuana cigarettes on the suspect. The suspect is a 16-year-old resident of Santa Rosa whose name will not be released because of his age. He was arrested and booked into juvenile hall on suspicion of numerous drug offenses, police said.